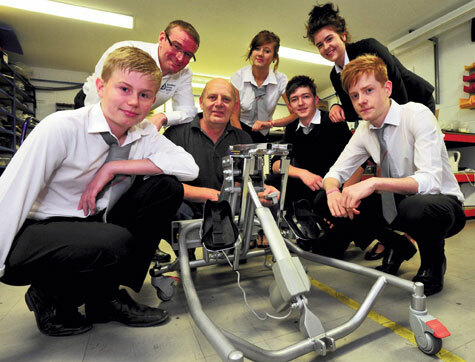 De Ferrers students visit Specialised Orthotic Services to learn about design and manufacture (front) Peter Norman and Sam Johnson with (rear from left) Jon Prescott, Stuart Pegg, Adele McGrath, Jonathan Tanser and Joanna Brooks. Sixth form pupils from de Ferrers Academy Trent Campus, in St Mary’s Drive, Burton, spent the morning at our factory to learn about manufacture and design. “They spent 90 minutes with us and were given a full tour of the facility.